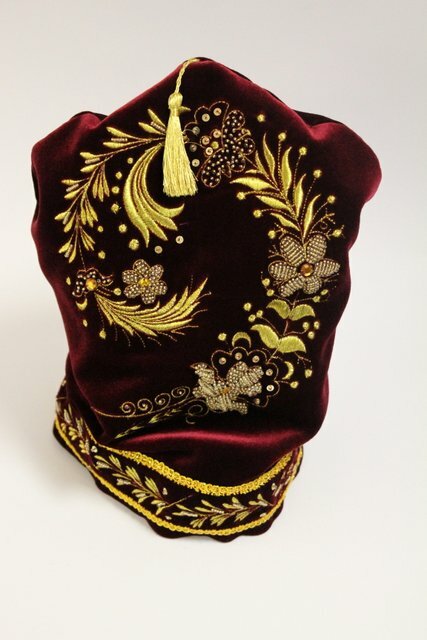 The Kalfak of the Kazan Tatars is the ancient and famous headdress preserved in local costume, even when the “city clothing” replaced the traditional clothing. Women in Kazan still continued to wear kalfaki, however, greatly reducing them in size. Kalfak has always been made of expensive fabric, in this case of velvet, and decorated with embroidery, gold, silver threads, and beads. Throughout Tatarstan one can find dozens of varieties of the kalfak, though today they can be found only in the attics of the village houses and trunks of old ladies.